Manchester-based publisher LADbible has apologised to the family of terminally-ill Sunderland fan Bradley Lowery after mistakenly reporting the six-year-old had died. Bradley, from County Durham, has neuroblastoma and is now receiving palliative care at home. It's understood that trolls had begun an RIPBradley hashtag on social media on Sunday which was picked up elsewhere. LADbible then carried a report which was swiftly withdrawn once the error was realised. The publisher said it was investigating and "unreservedly" apologised to Bradley's family. It also pledged a £20,000 donation to his fund. Following the incorrect reports about his death, a Facebook post from the family read: "I have spoken to the lad bible who have apologised for their mistake and would like to support Bradley's foundation moving forward. "Although seeing the status was very upsetting mistakes happen and we would like to accept the apology and move forward from this. "We have built our campaign on positivity and we would like to continue with this." 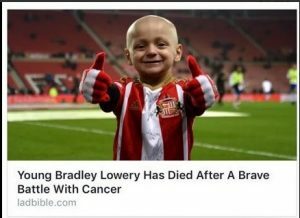 In a statement, LADbible said: "Earlier today we posted an incorrect story about Bradley Lowery, the inspirational young Sunderland supporter whose courageous battle against cancer has captured the hearts and minds of people around the world. "We realise the magnitude of our error and unreservedly apologise to Bradley and his family. "We're now investigating how and why this story was published to our website. It should not have been. "We are in contact with Bradley's family to discuss this matter further, and have already committed to a £20,000 donation to support his neuroblastoma treatment."